This month we’re really excited to recognise a group of Crimefighters passionate about taking small steps to make big gains in keeping their communities safe. Join us in congratulating this month’s winners of the prestigious Crimefighter title! Our nomination for Chrissi this month cited her excellence in detailed incident reporting, but the contributions she’s making go well beyond that. Working with her loss prevention teammate Rebecca Ellen-Johnson, she’s on a mission to recruit all her co-workers into fighting crime and making her community a better place. As for how they’re using Auror, Chrissi says it’s a huge help with the intelligence she needs to ID offenders and prevent crimes before they happen. Our nomination for Tamara this month cites her extraordinary efforts to bring new Police users from Western Australia into the Auror community. On her own, she’s managed to recruit nearly a dozen police officers from Western Australia to make Auror a part of their daily work routine, and she’s not stopping there. “I had a good relationship with the local police even before we stared using Auror, but it’s helped make it that much better,” she says. 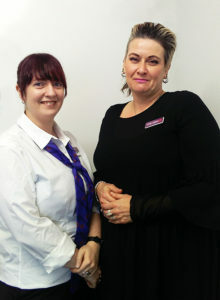 Tamara has even become an in-house expert on Auror for the rest of the Vicinity team, holding informal training sessions with her co-workers on best practices to fight crime in their shopping centres. Michael Black is a machine. If you’ve ever seen a drive-off incident on the Auror Feed from the Wellington area, it’s probably accompanied by a comment from Michael with the outcome of his diligent follow-up. As a road policing officer, most of Michael’s time is spent behind the wheel. While he’s parked up, he uses his mobile to scan the Auror Feed or look up vehicle details and spot offenders on the go. Often he finds that offenders that have done drive-offs are also disqualified or forbidden from driving by the courts anyway, making it all the more important to get them off the roads. He’s even started memorizing plates that he’s seen on Auror and likely areas to find them. Now that’s the sort of commitment we can all admire. Well done Michael!